ANU Sport’s Lifestyle programme, ANU Sport Centre studio 1. Please bring yellow payment receipt to first class. These live music classes offer priceless fun, exercise, socialising and skill building (whether a complete novice or experienced dancer). ANU Sport & Recreation is located in Building 19 (David Cocking Sport & Recreation Centre), North Road, Australian National University, Canberra ACT 0200. 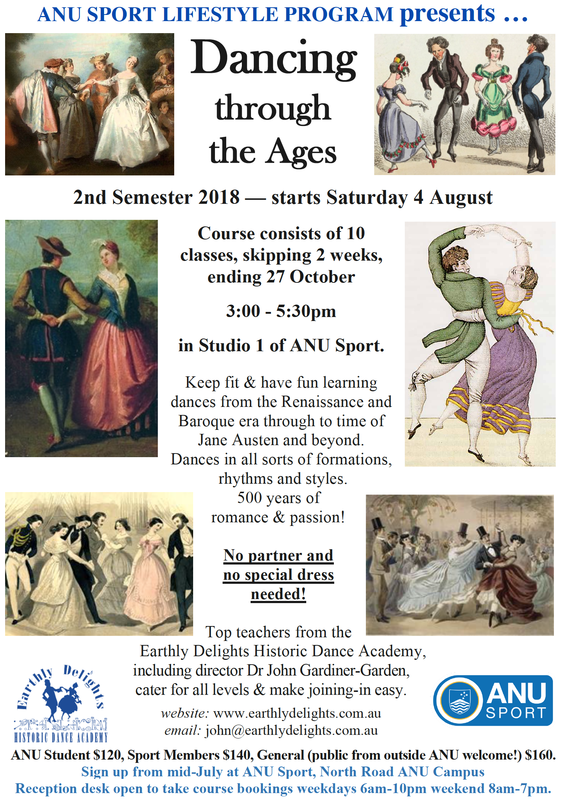 Have fun learning 500 years of dance (Renaissance, Baroque, Jane Austen & Victorian era) with Dr John Gardiner-Garden and wife Aylwen. Open to boys and girls with any level of experience aged 10-17. No special dress needed. in the afternoon, details tbc. Learn more, have extra fun, get to work with original century old dance books, and enjoy the possibility of doing costumed public displays, by taking the extension classes on Wednesday evenings. Class participants will need to bring smooth soled shoes and their own bottle of water (water bottles and t-shirts with academy logos are available from our accessories page). Past Wednesday nighters have enjoyed exploring many many corners of our dance heritage, and enjoyed many wonderful performance outings, including interstate (though participation in the latter is entirely optional). The dance leadership is offered by academy's dance director Dr John Gardiner-Garden and the costume leadership, when wanting to plan for displays, by the academy's costume director Aylwen Gardiner-Garden. Those who are enrolled in both Saturday and Wednesday classes have access to free costume hire for balls and displays. Those enrolled for one dance class series have access to half-price costume hire. Our facility is a private and self-contained environment in central Canberra. Some of the Workshops offered in the past have been Elizabethan, 18th century and Regency stays, Victorian corsets, Elizabethan gowns, 1780s gowns, regency gowns, victorian bustle gowns, regency tailcoats, bonnets and chemises from all eras. Contact Aylwen if you wish to book a class or have her visit your town to run a class for you.